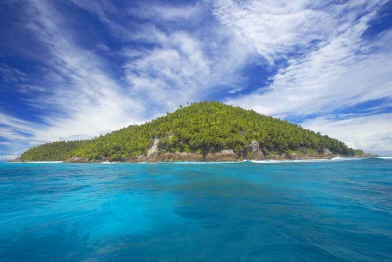 The Republic of Seychelles is an archipelago of 115 islands anchored in the western part of the Indian Ocean. Seventy-three of these islands are founded upon coral while the rest, including Fregate, are granitic. The nation’s capital is Victoria, on the island of Mahé. Its people are known as the Seychellois. Fregate is a twenty minute flight east from Mahé. It lies four degrees south of the equator, and far, far away from the clatter of modern life: approximately 1,000 miles south of India, 1,000 miles east of Africa, and 1,000 miles north-east of Madagascar. A French colony in 1770, the Seychelles was annexed by the British in 1811, became an autonomous colony in 1975, and achieved full independence in 1976. The island is small, which makes it ideal for exploring on foot. It covers a mere 740 acres (1.15 square miles, or 3 square kilometers). The highest point is Mount Signal, which reaches a peak of 125 meters (410 feet). The year round temperature is 24-30° Celsius (75-86° Fahrenheit), and because the Seychelles lies outside of the cyclone belt severe weather is highly unlikely. The connection between Mahé, the main island upon which the Seychelles International Airport is located, and Fregate Island is by private chartered aircraft (Airplane or Helicopter). The connection has to be booked in advance by the guest at the appropriate rate. 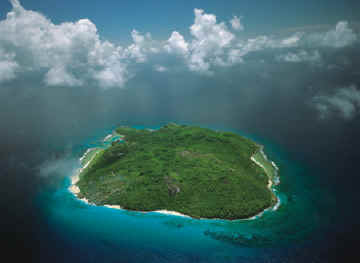 Reservations for this connection can be made through Unique Experiences GmbH or directly with Fregate Island Private. Upon arrival at the International Airport you will be met by the resort representative who will assist you to transfer to your flight connection to Fregate Island. It is reccommended that with the assistance of the concierge, all returning flights from the Seychelles and Fregate Island be reconfirmed at least 24 hours prior to departure. Shared transfer flights may be available for the fifteen-minute transfer to Fregate Island. Guests who wish to use this service may do so by advising Fregate Island Private, and every effort will be made to combine passengers for a flight. 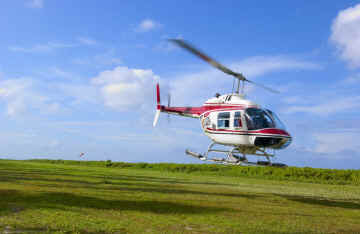 The cost of the flight will vary, depending on the number of guests per flight. Approximate flying time for Helicopter or Twin Otter: 20 minutes each way. All rates & services are subject to change without notice.